“I Am the Walrus” is the answer. At least it is Jon Friedman‘s choice. 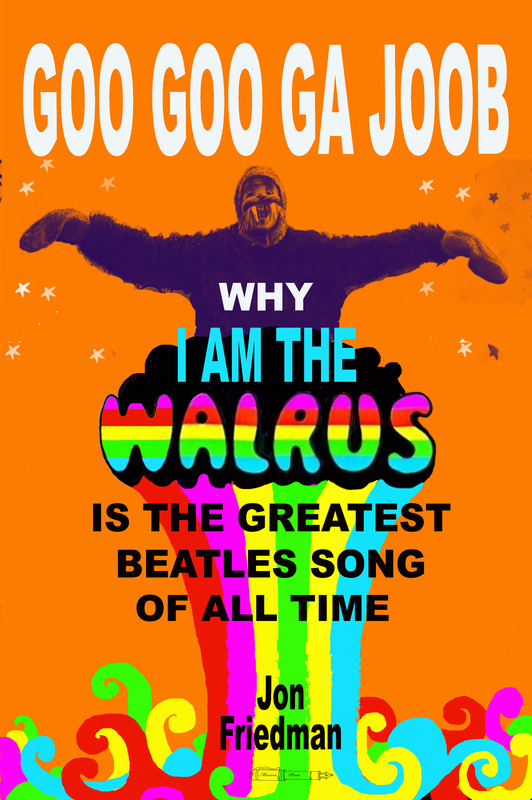 The author of Miniver Press’ new book “Goo Goo Ga Joob: Why ‘I Am the Walrus’ is the Greatest Beatles Song of All Time” makes a convincing case for John Lennon’s twisted 4-minute and 36-second masterpiece, complete with its references to everything from Edgar Allen Poe to the Eiffel Tower — with a snippet of King Lear tossed in. Friedman, the author of “Forget About Today: Bob Dylan’s Genius for (Re)Invention, Shunning the Naysayers, and Creating A Personal Revolution,” revels in the many mysteries and rewards of “I Am the Walrus.” What mysteries? OK — “everybody’s got one…everybody’s got one…everybody’s got one” WHAT? The author also puts the brilliance of “I Am the Walrus” into historic and cultural perspective. He notes that it, significantly, was the first Beatles recording following the death of their 32-year-old manager and close friend Brian Epstein, that it closed out The Beatles’ dabbling in psychedelia and that it presaged the band’s discontent with Abbey Road, their longtime studio.No matter what you pick as The Beatles’ No.1 song, you will enjoy reading this book — and you may even find yourself singing along to “I Am the Walrus” by the time you’ve reached the end. After all, we are all together.